Bulldogs announce new No. 1 ticket holder! Simon Garlick discusses the appointment of the new Bulldogs number one ticket holder. From fan to sponsor to board member, Alan Johnstone has assumed many roles when supporting his beloved Club the Western Bulldogs and in 2014 he will take on another - as the official Number One Ticket Holder. Johnstone has been a loyal member and fan over many decades, with his involvement in an official capacity beginning as a sponsor in 1981, through his business Penfold Motors. 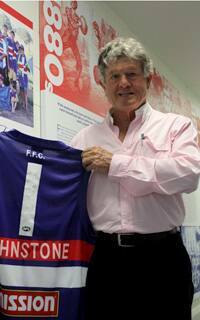 Club legend Charlie Sutton was first to extend his hand to Johnstone in 1981 to join the Bulldogs board, which he graciously accepted, holding the position for a number of years. Since then his involvement has been ongoing, joining the board for a second time in 1996 as part of a taskforce, alongside David Smorgon, Ray Baxter and Rick Kennedy. Alan and his wife Joy continue to support the Club today through sponsorships in association with their business ventures and are also significant contributors to the Western Bulldogs Forever Foundation. The love of the Bulldogs has been passed on to his children and grandchildren as Johnstone continues to attend as many games as he can each season. Bulldogs Chief Executive Simon Garlick said Johnstone had an profound impact on the Club throughout his time and is a fitting appointing for the Number One Ticket Holder status. “Alan is not the most high profile of our supporters but his contribution is incredible over decades for our football Club,” Garlick said. “He has been in an official capacity a board member on two separate occasions but I think in between those times his contribution in official capacities can’t be underestimated. “He is as supportive, as generous, as giving of his time to this football Club as anyone I’ve encountered.